When former president Jimmy Carter traveled to Havana in May 2002, he attended a Cuban all-star baseball game. 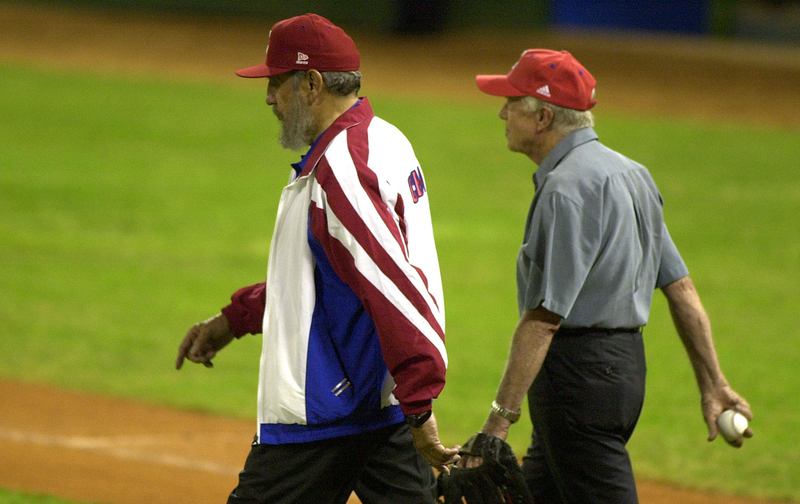 Over the objections of his Secret Service agents, Carter joined Fidel Castro on the mound, sans security, to throw out the first pitch. By benching his security detail, Carter publicly demonstrated respect for his hosts and confidence in just how normal US-Cuban relations could become. Since the beginning of the 20th century, when US occupation forces distributed bats, balls, and gloves to win the hearts and minds of Cuban kids, baseball has been a national pastime in Cuba, much as it is here. The media image of Obama tossing the first pitch—if his security detail permits him to go on the field—will send a clear message to sports aficionados from Middle America that our common ground with Cuba includes the baseball diamond. It will also send a message to Cuban fans that competition on the playing field will be a great bonus of normalized relations. Just as Ping-Pong paved the way for Richard Nixon’s opening to China, “béisbol diplomacy” should help smooth the political road for Obama’s historic trip to Cuba. The original proposal to use baseball to advance engagement with Cuba dates back 41 years, to a series of exhibition games planned for March 1975 by then–MLB commissioner Bowie Kuhn. Kuhn first approached Secretary of State Henry Kissinger with the idea at a Christmas Eve soiree in December 1974; he followed up with a formal letter in January 1975 and, after a meeting with Cuban sports officials, a phone call to Kissinger’s office in February. The Cubans want to play ball, Kuhn told Kissinger’s top aide for Latin America, William Rogers. But Kissinger was not convinced. Despite Kuhn’s repeated requests, the secretary of state vetoed the idea. After 18 months of secret meetings, the Kissinger-Castro talks failed. It took another 24 years before President Clinton finally authorized the first game, part of his administration’s “people-to-people” diplomacy with Cuba. The game was the brainchild of former Washington Post reporter Scott Armstrong (who was also the founder of my organization, the National Security Archive). Along with filmmaker Saul Landau, Armstrong approached Baltimore Orioles owner Peter Angelos with the idea of taking his team to Havana. They then practiced a bit of “skybox” diplomacy, luring Clinton’s national-security adviser, Anthony Lake, to watch a game at Baltimore’s Camden Yards with Angelos and lobbying him for approval. Even with White House backing, it took months of haggling between the Orioles and the State Department to arrive at an arrangement that would allow the team to go to Havana. Cuban authorities were welcoming, but State Department officials repeatedly sought to impose conditions on the games—who could go, how tickets would be distributed, and how the proceeds from the television rights to the game would be allocated, among other restrictions—which almost led to cancellation of the project.